© IWM (Art.IWM ART 1460). John Singer Sargent, ‘Gassed’ (1919). A remarkable group of paintings was commissioned by the British government towards the end of the First World War as a memorial to the dead. The committee who commissioned the series of paintings saw them as, “the greatest artistic expression of the day.” They wanted to permanently display the paintings in a bespoke memorial gallery, known as the Hall of Remembrance, but this ambitious plan was never realised. The entire project ran out of time and money and the Imperial War Museum became the custodian of this collection. Explore the story of the never-built Hall of Remembrance with our interactive experience. Some of Britain’s most talented and influential artists of the First World War period produced large oil paintings for the Hall of Remembrance that never was. These ten paintings represent a selection from the extraordinary series. The most iconic painting in the Hall of Remembrance series is John Singer Sargent’s Gassed. Sargent was approached by Prime Minister Lloyd George to create a painting for the Hall of Remembrance. He was sent to France in July 1918 to gather visual material at the Front. Gassed depicts young British soldiers temporarily blinded by a gas attack, and was inspired by a scene that Sargent witnessed himself. When the painting was first displayed to the public in May 1919, its realism reportedly moved some people to the point where they felt physically ill at the sight of the mass of wounded bodies. Henry Tonks is perhaps better-known for being the drawing master at the Slade School of Art and teacher to the likes of Paul Nash, Stanley Spencer and C.R.W. Nevinson. He was also a trained surgeon, and during the First World War served with the Royal Army Medical Corps. Therefore, Tonks was an apt choice to depict an advanced medical dressing station. 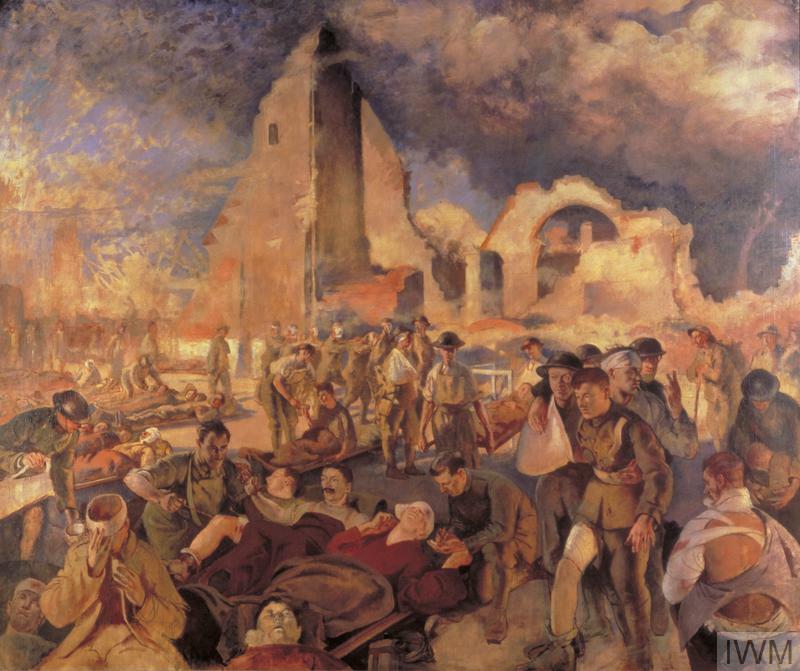 The painting captures a scene amid a German offensive in 1918, within which Tonks makes full use of his medical expertise to showcase a wide range of injuries, treatments and field dressings. An Advanced Dressing Station in France, 1918, by Henry Tonks. Young artists working in modernist styles were sought out by the British War Memorials Committee because of their innovative art practice and their direct experience of the First World War. 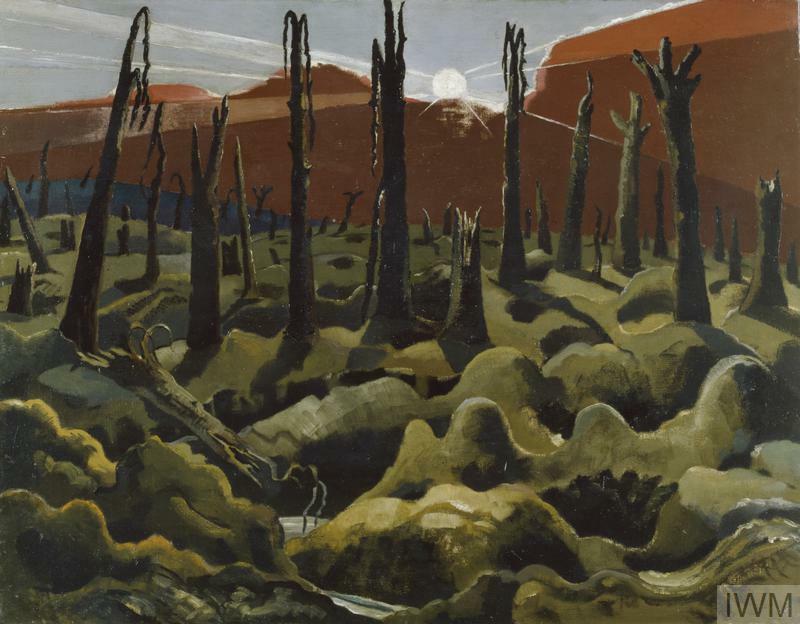 One of these artists, Paul Nash, said he wanted to, “…rob the war of the last shred of glory, the last shine of glamour…” Nash was asked to create a large painting of a Flanders battle scene, which he did in The Menin Road. The road itself is almost completely obliterated, and filled with shell holes. 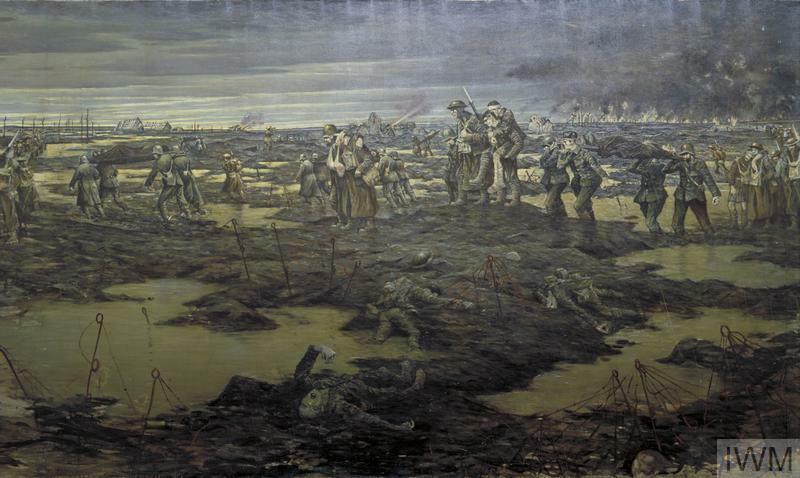 The painting evocatively represents, "those wastes in Flanders, the torments, the cruelty & terror of this war." 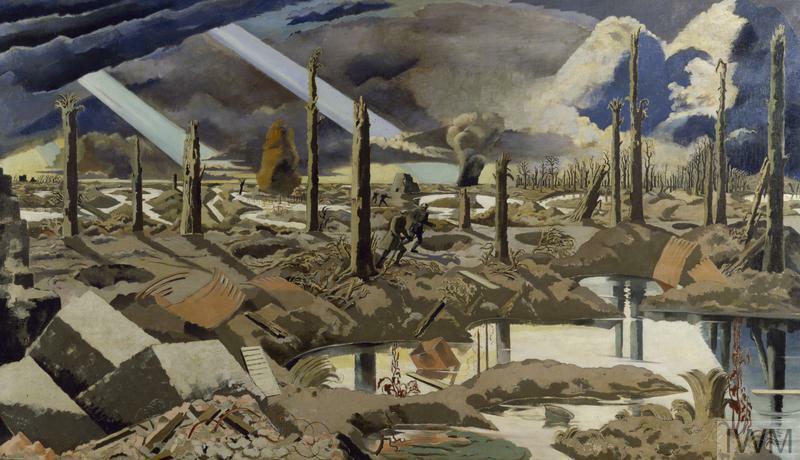 Paul Nash, ‘The Menin Road’ (1919). Paul Nash canvassed for his brother, John, to also become an official war artist. The brothers shared a studio at Chalfont St Giles, where John Nash created his painting, Oppy Wood, 1917. Evening, showing two soldiers peering out from a trench across the waste of no man's land in France. 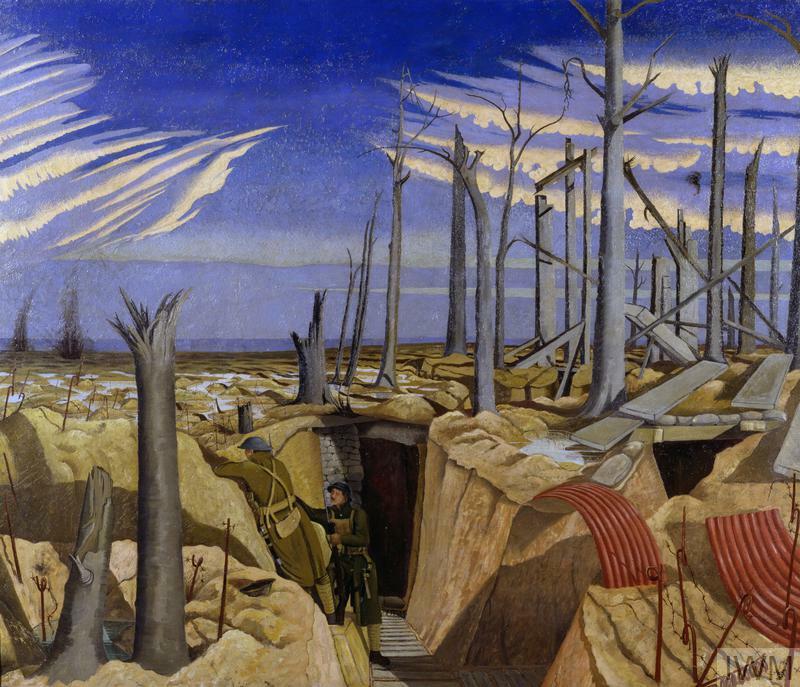 Before becoming an official war artist, John Nash had served as a soldier at the Western Front in the British Army in 1916. For his commission, he elected to create a painting that summarised remembered experiences, rather than re-visit France to sketch. Oppy Wood, 1917. Evening, 1918, by John Nash. © IWM (Art.IWM ART 2268). 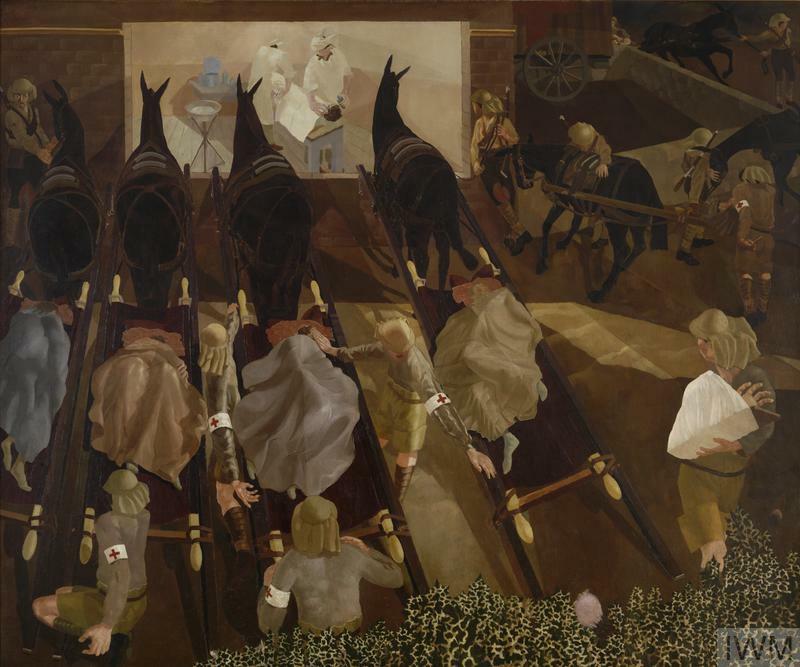 Stanley Spencer, ‘Travoys Arriving with Wounded at a Dressing-Station at Smol, Macedonia, September 1916’ (1919). Stanley Spencer served as a medical orderly in Macedonia during the war. Travoys Arriving with Wounded at a Dressing-Station at Smol, shows a temporary operating theatre in an old Greek church. Spencer later wrote of the scene, "I felt there was a spiritual ascendancy over everything." He revealed in letters his difficulties with being a soldier. His father tried, unsuccessfully, to secure his release from military service. He was unable to begin his painting commission until after demobilisation in 1919. When the Hall of Remembrance works were put on display in 1919 by the Imperial War Museum, the public reaction to them was mostly positive. However, some journalists and art critics disliked any works that displayed what they termed “ultra-modern” styles. 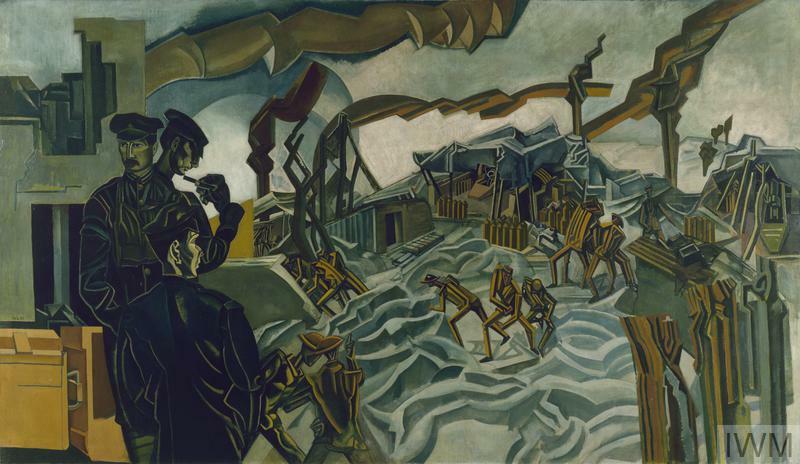 A Battery Shelled by Wyndham Lewis was one such work that challenged traditional tastes. It depicts the apparent merging of men and machines in the artillery regiments of the Western Front. In style and content this painting was one of the most controversial to come out of the First World War. Percy Wyndham Lewis, ‘A Battery Shelled’ (1919). In the early years of the war, C.R.W. Nevinson worked in an avant-garde style as Britain's only Futurist. His work become more naturalistic as the war progressed because he felt compelled to visually report what he witnessed. The Harvest of Battle depicts the aftermath of an offensive in the Ypres Salient, “A typical scene after an offensive at dawn. Walking wounded, prisoners and stretcher cases are making their way to the rear through the water-logged country of Flanders.” Nevinson’s use of dark colours and depiction of dead bodies in the painting reveal his determination to show the grim reality of the war. C.R.W. Nevinson, ‘The Harvest of Battle’ (1919). When shown together, the Hall of Remembrance paintings were intended to represent and commemorate all aspects of the war effort, including the homefront. 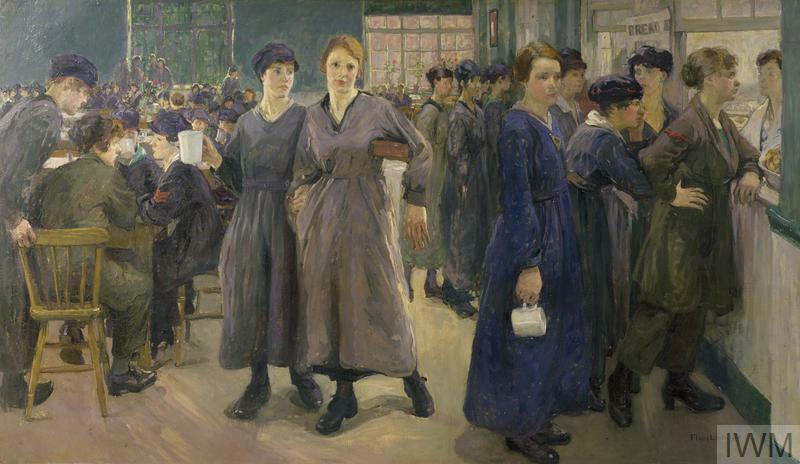 George Clausen’s In the Gun Factory at Woolwich Arsenal, 1918, captured the interior of Britain’s largest munitions factory. Like Gassed the painting contained imagery that bordered on religious, without being explicit. 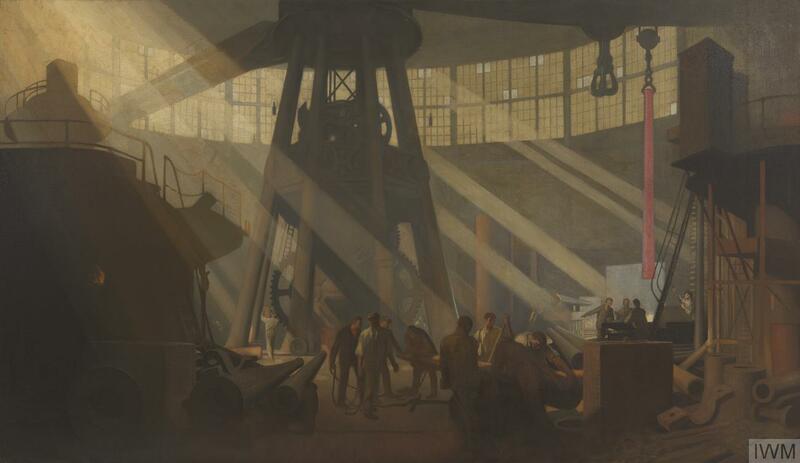 Ever fascinated by the effects of light, the high cathedral-like interior of the factory offered great scope for Clausen to experiment with dramatic diagonal shafts of sunlight that cut through the gloom and furnace heat of the factory. George Clausen, ‘In the Gun Factory at Woolwich Arsenal, 1918’ (1918). Voluntary Land Workers in a Flax-field by Randolph Schwabe. Randolph Schwabe was a well-known British artist and professor at the Slade School of Art, but during the war he worried that his German heritage might cause him problems. Nevertheless, he was approached to create a Hall of Remembrance painting for the British government. 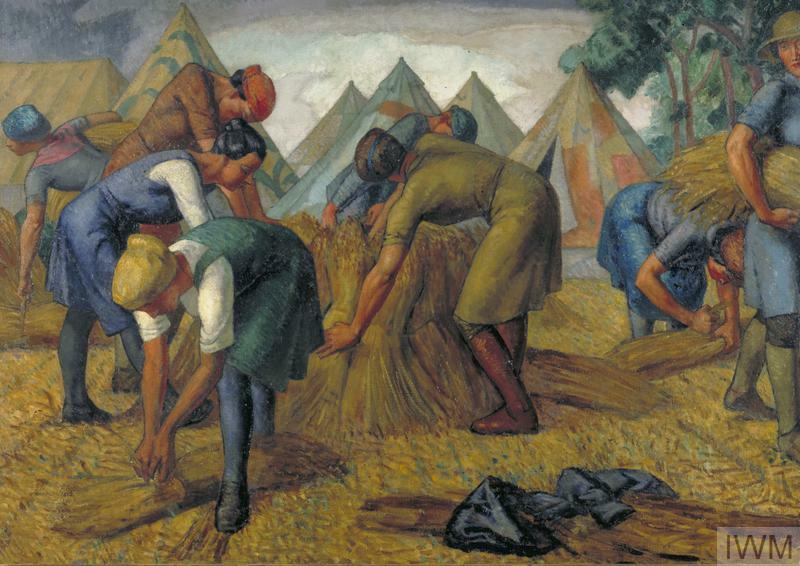 Schwabe suggested that he cover land subjects, and created Voluntary Land Workers in a Flax-field, Podington, Northamptonshire. The Hall of Remembrance paintings were supposed to cover a broad cross-section of war experience. However, Schwabe was the only artist to make a painting for the commission that focused on women and women’s work. Bernard Meninsky created The Arrival of a Leave Train, Victoria Station, 1918, after being asked to paint “…typical London scenes...” for his Hall of Remembrance commission. The subject suited Meninsky well, as he wished to concentrate on the human figure in his painting. His work was one of several paintings in the series that showed activity on the homefront in Britain during the war. Meninsky served in the Royal Fusiliers and had to secure special permission to work as an official artist. He sadly suffered a nervous break-down six months into his commission. Bernard Meninsky, ‘The Arrival of a Leave Train, Victoria Station, 1918’ (1918). There are more than 30 paintings and sculptures that belong to the Hall of Remembrance series, all of which are available through IWM’s online collection search, along with the rest of the art collection. To find more amazing art images go to: http://www.iwm.org.uk/collections/search. The results of each search are able to be filtered by Category: ‘art’. We are Making a New World, 1918, by Paul Nash. The war art schemes developed by the British government during the First World War were an unprecedented act of government sponsorship of the arts. As the schemes grew, they ultimately explored every aspect of conflict, from the violence of industrial warfare to hastened social and economic change at home.